Archives : BULLISH 2012 RAISES HOPE FOR 2013 - 28/12/2012. BULLISH 2012 RAISES HOPE FOR 2013 – 28/12/2012. The year 2012 started on a pessimistic note but is ending on a very bullish note. Sensex netted over 4000 points and Nifty around 1300 points for the year ended 2012, which translates into a gain of over 26%. The market went from strength to strength amidst political uncertainty, increasing inflation and a reduced rate of growth. The same situation continues even now, but the market is looking more optimistic now. Thus the bar has been raised for the year 2013. Nifty is expected to have targets of 6488 – 7018 for the coming year, so keep your fingers crossed. Sensex opened the week at 19278, made a high of 19504, low of 19237 and closed the week at 19444. Thus it registered a weekly gain of 202 points. At the same time the Nifty opened the week at 5869, made a high of 5930, low of 5844 and closed the week at 5908. Thus the Nifty went up by 61 points on a weekly basis. 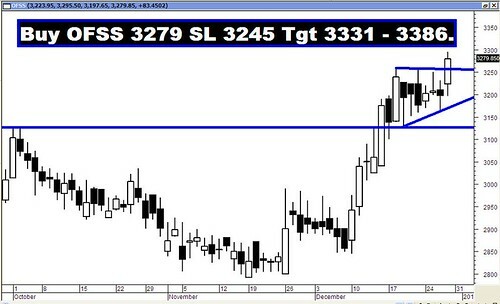 Both the indices have registered a Bullish Harami pattern on the daily charts, but it has once again occurred in a consolidation and hence this will be more of a continuation pattern. Similarly the weekly charts have nearly carved out a Morning Star pattern but once again this pattern has occurred at the top. Usually a Morning Star occurs at the bottom and is a Bullish reversal pattern, which is not the case here. Hence once again it is more of a continuation pattern. Candlestick Pattern analysis is not giving strong directional clues this week. The indices continue to remain above the medium term average of 50dma (Sensex – 18928 and Nifty – 5757), and long term average of 200dma (Sensex – 17730 and Nifty – 5382). The short term average of 20dma (Sensex – 19360 and Nifty – 5889) was continuously tested by the market throughout the past week and it has just about managed to close above that. Thus the trend in the short term, medium term and long term timeframes continue to remain bullish. On the daily chats, both Sensex and Nifty have formed a Bullish Diamond pattern and the target as per this formation is Sensex 20171 and Nifty 6192. Also market had tested the Falling Channel Top and bounced back from there. Hence the overall long term target for Falling Channel pattern breakout remains intact. The targets as per this formation are Sensex 20383 and Nifty 6148. Also on the weekly charts, both the indices have completed a Flag formation and the target according to the pattern comes in at Sensex 21024 and Nifty 6415. The targets will be achieved as long as the Sensex remains above 18255 and Nifty 5548. If we take the Saucer formation which is due to the fall from Sensex 18523 to 15748 and Nifty 5629 to 4770, then the target comes in at Sensex 21298 and Nifty 6488. Hence we have a Target zone of 21024 - 21298 on the Sensex and 6415 - 6488 on the Nifty. MACD is in Sell mode despite being positive while the ROC has just turned positive and has signaled a fresh Buy. The RSI @ 60 is trying to stay above the equilibrium line. MFI has reduced to 46, indicating money outflow. Stochastic Oscillator is at 53 and has given a Buy signal as %K has gone above %D. ADX has reduced to 26 indicating that the trend has lost some of its strength. The Directional Indicators continue in Buy mode as +DI remains above -DI. Meanwhile OBV continues to move sideways. The Nifty O.I. PCR is quite steady at 1.26. Highest Open interest build up for the January series is at 6000 Call and 5800 Put. This suggests that the market expects a small trading range for the Nifty with support coming in at 5800 and resistance around 6000 levels. Trendline Support for the Sensex is at 18958. Trendline Resistance for the Sensex is at 19757. Trendline Support for the Nifty falls at 5760. Trendline Resistance for the Nifty falls at 6009. For the week ahead, Sensex will find Support at 19149-18866-18590 and will find Resistance at 19697-19973-20238. For the week ahead, Nifty will find Support at 5823-5733-5649 and will find Resistance at 5982-6069-6144.